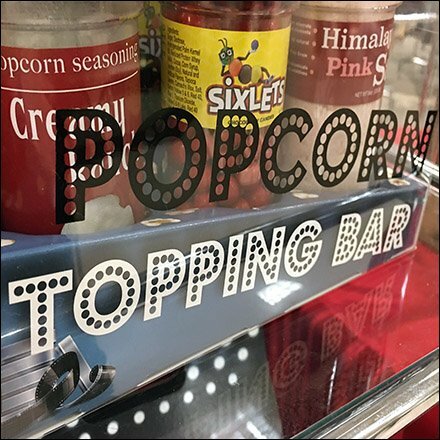 If tender and tasty popcorn itself does to tempt customers on its own, add the extra inducements of this Gourmet Popcorn Topping Bar Selection. Movie theatre style, Creamy Ranch, Himalayan Pink Salt, and the more cryptic Sixlets reach out for consideration. If popcorn is not enough to satisfy your customers, add a Gourmet Popcorn Topping Bar Selection to your inventory. This tasty inducement seen at BonTon Department Stores.